As a digital management trainee at ORMIT, I work on digital projects at BNP Paribas Fortis, Belgium’s biggest bank. This bank realises the world is changing fast and the digital revolution is a fact. As such, BNP Paribas Fortis uses the scrum framework instead of waterfall in order to quickly develop new applications. While I have not yet worked in an agile team, I did receive the chance to take the Professional Scrum Master I assessment from scrum.org. Here are my experiences while preparing for the test and some tips that may help you pass this test successfully. Ideally, you already have real world experience with scrum. For example, you have already taken the role as a scrum master or product owner. This may greatly help you in passing this assessment since you have applied the scrum principles in real life. Read the scrum guides. This will be your main source of information. This guide has to be seen as an essential handbook that contains the most important elements of what scrum is, the roles, … Another option is search on Google for scrum guides: there are plenty to be found and they all have their own focus. I’d recommend to maybe also even check out YouTube if you are very new to scrum: this may give you a first impression of what scrum is and how it is applied in a professional context. Practice with Scrum Open. The Scrum Open assessments are a great way to practice and improve your scrum knowledge. It’s a free test, offered by scrum.org themselves. Do the test at least 5 times, until you have a consistent 100% on these tests. Some questions of this free test return in the real assessment, so it is certainly worth it to invest some time in practising. Now you know how to best prepare for the test, here are some general tips I can give you in order to pass the assessment. First of all, read about burndown charts. In the scrum guide (as linked above), there is not much information on this topic. However, I had some questions on this topic during my assessment, so make sure you understand what they are and why they are used. While studying, you may use the scrum.org forums in order to ask questions or to look up certain topics. It’s a quite active community with many people just like you: who look to pass one of the assessments offered by scrum.org. There are 80 questions in total, but you only have 60 minutes. Use your time wisely and don’t waste 5 minutes on one question. During the exam. you have the opportunity to bookmark questions. If you have time left at the end, you can then return to your bookmarked questions. As a fourth point, I’d like to repeat: preparation is key so make sure you read the scrum guides and practice the scrum open! Good luck in passing the exam and in your (future) role as a certified scrum master! For your information: I passed with 90% (72 correct answers out of 80 questions), without having any real world experience with scrum. Here is my scrum profile. 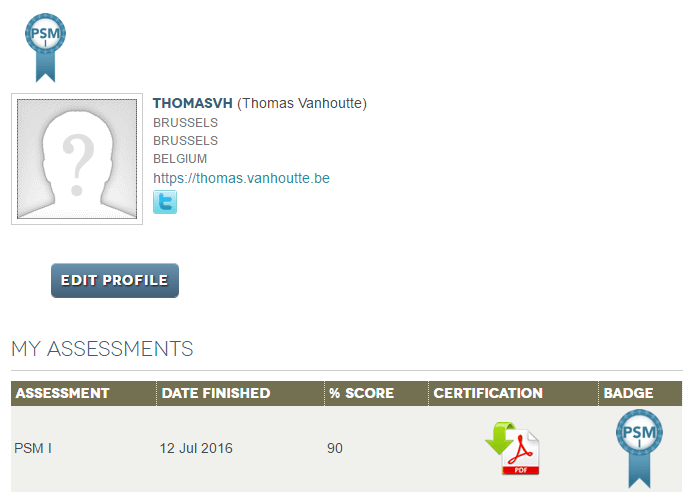 Gratulations Thomas, great score! Very interesting read. For someone new to scrum this is a really good guide to understand how to learn scrum and get certified for future job opportunities , The tips will come in handy when learning scrum methods and during the examinations. Thomas is a CRM business analyst in the Financial sector. I take on digital-centric challenges. All my blogposts are written in my free time and do solely reflect my personal thoughts. Have fun on my website and feel free to get in touch with me.